Watching the whole family tuck into the weekly Sunday roast while you enjoy a salad isn’t an option. With a little forethought and creativity you can enjoy exactly the same meal as everyone else with a fraction of the calories. A few simple rules make choosing the right centre-piece for your roast easy. The lightest choices of meat are chicken and turkey. Make sure that you steer away from the skin and choose light meat rather than dark for your plate. Roast your chosen meat using a rack inside the roasting tin. It keeps the meat away from the fat that has run from it. If you use the rack in a self-basting tin, you can still enjoy perfectly moist meat. Use plenty of flavour with the meat. Push half a lemon and a bunch of thyme or sage into the body cavity of poultry. For lamb, choose rosemary and garlic. When carving, discard any visible fat or skin immediately so you aren’t tempted to pick. After removing the meat, drain the contents of the roasting tin into a deep bowl. Cool slightly and then refrigerate. When the mixture has been thoroughly cooled, you will be able to scrape away the top layer of solidified fat. This leaves the highly flavoured stock jelly at the bottom of the bowl. Set it aside to use for the gravy. It keeps very well in the fridge for the following week’s roast. Keep the potatoes separate from the roasting meat so they don’t pick up any of the fat. Start by par-boiling the potatoes for around 5 minutes and drain them thoroughly. Give the pan a good shake so it ‘fluffs’ up the outside of each potato. Put the potatoes in a shallow tray and mist with plenty of low calorie oil spray. Sprinkle a little paprika over the potatoes and place in a hot- pre-heated oven, 200C for about 1 hour. To add a little extra flavour, you can continuously baste the potatoes by adding a sprinkle of highly flavoured stock. Start by making sure that you have removed all the fat from the roasting tin. Take the stock jelly from the joint and melt it over a gentle heat. When bubbling, add 2 tbsp of plain flour and stir in continuously over the heat. This is a really important part of the process as it gets rid of the ‘floury’ taste in the finished gravy. Gradually add hot stock left over from the cooking of the vegetables. As the gravy thickens each time, add a little more stock. You’ll probably use about 500- 600 ml depending on how thick you like your gravy. Season carefully and serve. The main ingredients of a Sunday roast - the meat, the vegetables and the potatoes can all be adapted really successfully to suit a low-calorie diet. Don’t ruin it by falling into the trap of enjoying traditional accompaniments which ruin your diet. Avoid creamy sauces like bread sauce or cauliflower cheese sauce. Yorkshire puddings are packed with fat. Content yourself with one small pudding or avoid them. Keep vegetables simple, steam or cook them lightly so they hang onto their vitamins and minerals. The key to successful low-calorie diets is learning to make changes to your diet that become lifelong habits. 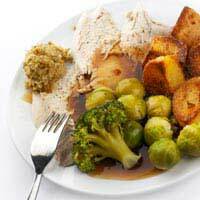 The lower calorie Sunday roast is a good example of simple and subtle changes which make no difference to your taste buds but a huge difference to your waistline.